Thyroid experts in the head and neck endocrine surgery team diagnose and treat patients with a variety of thyroid and parathyroid conditions including tumors, nodules and hyperparythroidism. If you have been diagnosed with a thyroid or parathyroid condition, you can count on our team to provide a personalized treatment plan, tailored to your unique condition and personal needs. Our team of otolaryngologists (ENT) are specialized in the treatment of head and neck endocrine conditions. Learn about this innovative technique for neck surgery that doesn't leave a scar on the neck. 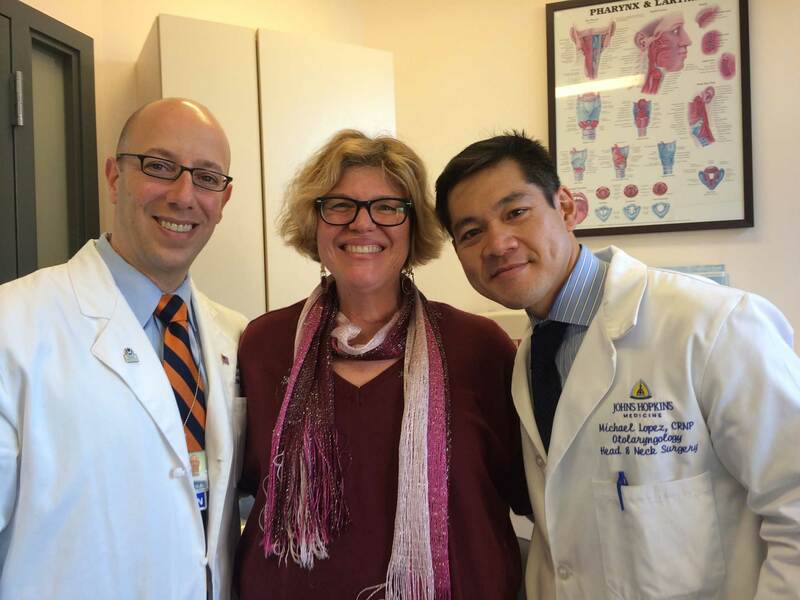 Patients share their experience receiving care at the Thyroid and Parathyroid Center. Our head and neck endocrine surgery team is composed of surgeons, endocrinologists, pathologists, radiologists and rehabilitation therapists who work together to develop an individualized plan especially that addresses your care before, during and after treatment. The team also includes you and your family, and we are dedicated to ensuring that you fully understand and are comfortable with the recommended course of treatment. Johns Hopkins head/neck/thyroid surgeon, Ralph Tufano, answers commonly asked questions about the treatment of thyroid tumors and how Johns Hopkins multidisciplinary team treats and diagnoses thyroid tumors and nodules. Transoral (Scarless) Thyroidectomy: FAQs with Jonathon Russell, M.D. Johns Hopkins head and neck endocrine surgeon, Jonathon Russell, M.D. discusses transoral thyroidectomy, or scarless thyroid surgery. He explains the advantages of this surgery, who is a good candidate and what to expect after the procedure.